A few weeks ago I was invited to TJMaxx and Marshalls’ headquarters near Boston and since I am a big fan (I’ve found so many cool things there) and was unable to attend, I sent my sister Becca in my place. Now she is sharing with us her experience. Thanks Becca & TJMaxx! While at T.J.Maxx & Marshalls' headquarters, it was interesting to see how they get great deals on all of their merchandise. They are able to buy in-season things last minute directly from designers and since they can sidestep all the fancy-foot work they are then able to get items to the floor very quickly. I was impressed by their company culture, along with how they have buyers travel the world all year long (instead of only select seasons) to score great deals to bring to the customers. * Of the designer and top brand name merchandise more than 85% of it is current-season. * Each store receives 10,000 pieces of merchandise weekly!! * 95% of their items are first quality and only 5% of items are unnoticeably irregular. * TJMaxx and Marshalls receive different merchandise. Also while I was there they asked me along with other bloggers to participate in a Secret Santa to see what great gifts we could find at our local TJMaxx when we got home to send to another person. Here is what I found all for under $50, which would have normally been double the price! A cozy super soft faux fur throw, a set of glass candles, Lindt's truffles, a white glass dish, and a little grater from Italy. It is pretty cool that you can score deals like this at TJMaxx and Marshalls. It makes for a great money-saving place to stop by and shop during the holidays. 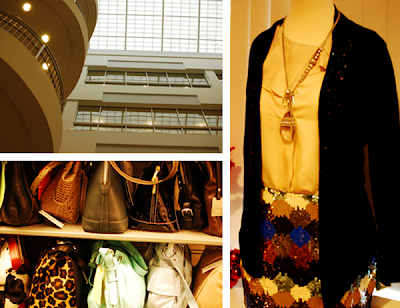 Thanks for the experience to see up-close what goes on behind the scenes TJMaxx! What about you readers? 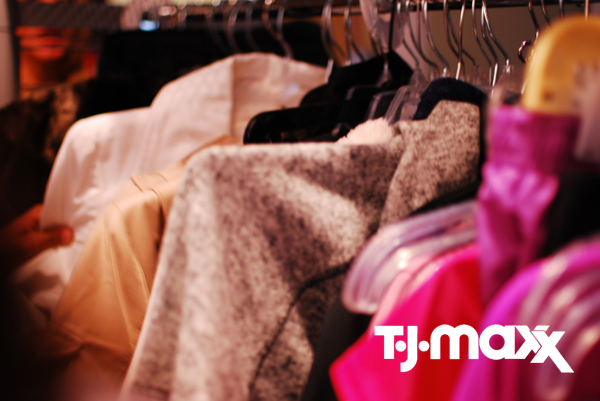 What cool things have you found at TJMaxx or Marshalls? * The secret giveaway is to win a $100 TJMaxx or Marshall's Gift Card! Leave a comment with what you are more thankful for on this TJMaxx post or this post (yes you can enter twice on both posts if you would like) and the winner will be randomly selected on Monday November 29th and announced on twitter. Make sure I have a way to get in touch with you. Best of luck and Happy Thanksgiving! ** Winner announced on twitter and giveaway closed. An incredible sweater that every time I wear it I get compliments... and it's Ralph Lauren! PS. Your blog is a daily read for me! That is cool stuff to know about the company and I know you can occasionally find some great stuff, however, I can rarely go to any of my local stores because of how extremely disorganized they are...I get anxiety just looking around. I wish they had quality control over their stores, and better customer service...they really need to work on those. so sorry for the delete! All my sister in laws, aunts work there, the place is incredible, filled to the rim with well dressed women- there is no recession going on in there! I have found many great pieces, once in colorado i scored a long wool coat that looks like a piece of art, people always stop me and ask where? i love buying ralph lauren things for my nieces and nephew at half or less of the price and i have scored some good shoes aswell! I found a gorgeous Nine West leather jacket for around $100 a while back. It's a lifetime piece for sure. I've found many beautiful things there over the years, lovely towels, crystal pieces, beautiful plates, etc. I got pieces of my wedding crystal for a tiny fraction of their normal price, never seen them since that one time. You can't go looking for something specific or you will be disappointed. When you see something you like, buy it because it won't be there if you go back!! I am so thankful for the time and luxury to eat good food and be with friends and family. Pretty simple, but something not everyone has! ahhh I'd love to win this! I buy all of my cooking toys from TJ Maxx because they have such amazing prices :). i am thankful to be nearly done with christmas shopping for the year! I'm thankful for great bargains on boots and shoes for the holiday season! thankful for fun secret giveaways!!! I am also thankful for my wonderful family....a mom, a dad, a brother and sister...all of whom I truly call "friends." I am thankful for music and especially the fact that I get to see live shows -- nothing makes my heart sing more! I'm thankful for finally having family nearby this thanksgiving. It's so nice to celebrate with someone else! I am thankful for my cute husband and family! Happy Thanksgiving! I'm thankful for a warm home and my family around me on this freezing night. I'm thankful to be alive and well! I am thankful for my husband, kitties, and family, our health, and my new job! i am most thankful for finally feeling like myself again. i am so happy and optimistic right now, i can hardly stand it! it's a truly wonderful feeling after a couple of years filled with ups and downs. I'm thankful for my little family. Happy Thanksgiving! I am thankful for where I am in life right now and everyone who shares theirs with me. i'm thankful for my cozy home! i always seem to score the best with towels and bedding at places like marshall's. love 'em. hate to be cheesy, but family and friends are at the top of my list. (secret giveaways aren't bad either!). I'm thankful for my beautiful and supportive family! I'm most thankful for my health! Family. Family. Family. That's what I'm thankful for! It is something that I often take for granted, but I am so thankful for technology. It allows me to talk with my parents and little brother on the phone daily, video chat with my boyfriend who attends another university, and comment on fun design-y blogs with secret giveaways! I am thankful for my first thanksgiving with my husband. Me and him and cinnamon rolls! I'm thankful that stuffing the turkey this morning wasn't nearly as disgusting as I thought it was going to be. Still gross, but not THAT bad. I cherish the moments with my friends, it's like every day childhood time. We do not celebrate Thanksgiving in France but still, I am grateful for having given birth to a healthy baby. Bonne journee! I'm grateful for crazy family feasts, my health and home, warm clothes and delicious food. Also for this beautiful country we live in and all the diversity in it. I have never left disappointed! I always find a treasure. I'm super thankful for my fabulous family and friends, and for the fact that I'm self-employed. Sometimes it's hard, but totally worth it! I'm thankful for the hair straightening iron that I bought at marshall's earlier this year at almost 70% off regular price! Its amazing! I am grateful for feeling the warm sun on my face. I LOVE Marshalls! I'm most thankful for friends and family who are supportive of me. Thanks for the chance to win! I am thankful for a roof over my head and food in my stomach this holiday season! im thankful for my clear mind. take care. a great ralph lauren jacket...love it! I am thankful that I am finally a mother this year!! I am thankful for a wonderful sister in law Rachel J.
so thankful that both of my brothers were able to fly home for our nana's funeral last week. having them be here for support was unexpected, and i'm so grateful. I'm thankful for my faith. It affects everything aspect of my life in the best way possible. I am thankful and for good friends and family. Time spent with either is never time wasted. My big yellow bag that has gone everywhere with me this past year. And is soon to become a diaper bag for my new babe. It's that awesome. I'm thankful for all the awesome people in my life. I love my family and I'm thankful for credit card points to fly us to them on holidays! I am thankful for the ability to hear. From the seemingly mundane crickets chirping on a summer evening to the most beautiful pieces of music, every sound is a gift. I'm thankful for beauty in all its guises! I am most thankful for the happy surprises that are all around us, if we bother to look. I have a wooden sculpture piece in my living room that is the Chinese Character for "Double Happiness", it is traditionally used in weddings. I found it sums up how I feel about my children. It is bright red and adds a pop of color to my room and it the best 15.00 I have spent in a long time! I am thankful for your inspirational blog! I am most thankful for my boys love and health. Happy Thanksgiving! I'm thankful for my amazing husband and daughter! I am so thankful for a wonderful family! I'm thankful for the little boy growing inside of me!! Isn't that one crazy miracle?! I'm so thankful for the health of my family and friends - we're a lucky bunch. I just bought a pair of black peep-toed espadrille wedges over the summer at TJMaxx. I wore them EVERYWHERE! What a cool experience, would be insanely cool. Thankful for the health of our family this year, and of course the sacrifice our troops make to keep us protected throughout the years.